Writing the about me section can be quite difficult and compelling. The entire industry exists so that it can enable you to tell your story better. The creative directors, copywriters and some strategists wouldn’t like it if you aren’t able to communicate properly. You should be articulate and strong enough. There will definitely be no way around that. You have to spend some energy and time about the page because it happens to be one of the best and most visited pages on the website. In this post, we are going to help you with that. Keep reading to find out. The first and most important rule to write an about my page is that you need to have a good idea of who you are talking about. This happens to be the most overlooked part of the business and brand communication. Every message that you craft will begin by understanding things from the audience’s point of view. If you don’t have an idea of who you have been talking to, you will not be able to write a proper about me page. You should begin with why but also remember who you are talking to. The second point is letting people know what you are all about. Therefore don’t just mention facts but also speak about other qualities that you possess. You have to make the website a window and not some wall. It is quite easy in fact to write down all the facts but if you show off yourself and speak about your personality a bit more, your viewers will be more interested in reading your work. Always keep that in mind. Third, remember to design the page properly. Even if it is just your about my page, do remember that people are keen on know about you. Therefore, when you are writing down about yourself, a good design will always do wonders. A few elaborate and floral designs are exactly what you need. Put them on the site. Apart from that, you can also use pretty colours to brighten up the page. That will keep your readers interested. The about my page is a wonderful opportunity for people to know what you are all about. Therefore, when you are putting it down, do talk about your ideas, faith and beliefs. Things like these matter a lot. It can really make a good impression on you. Those of who love reading blogs must take a look at others and how they have written their about me section. See what is so attractive about their page. What did you like reading about them the most? Study carefully and put all points down. You will definitely be able to write a good one. Before you update the about my page, here are few things you should have full knowledge about. 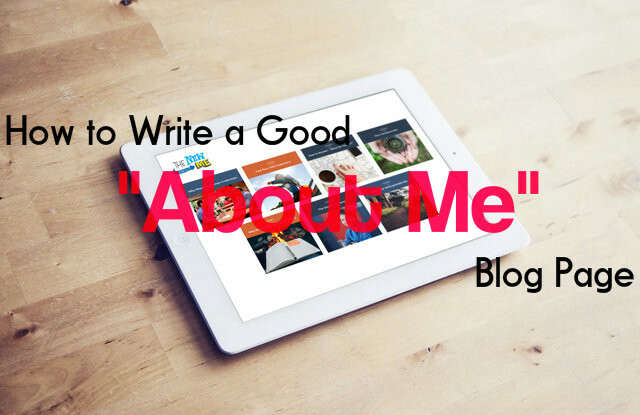 First and foremost, talk about why anyone would like to read your blog. You could mention a sentence like if you like this, then my website is the best page to come to. Second, think about your audience and what they will get out of these posts. Will they be getting any sort of fashion inspiration or maybe some free business advice? Are you all about health and beauty or do you want to encourage women? You should let them know what they may expect from you. Third, think if your blog has any kind of credibility. The ones shown here are quite flexible. You could enlist names of some big sites, you have to talk about the experience you have had in this field. All of this can really help. Always remember that writing a compelling bio is hard. This is the reason why industries are able to tell the stories better. If you want to encourage people to read you’re about my section, you have to mention some proofs and testimonials that will definitely help. Talk about the experiences you have gathered so far and how it has helped you become successful. Spending some serious time and energy on that section shall definitely do you good. So don’t forget to mention that at all while writing your blog. Of course, this is your about my page but that doesn’t mean it has to be all about you. This is your chance to talk about what the blog is all about and what you are capable of. You may also speak about your professional journey and what you have done so far to get where you have wanted. The blog that you are writing about is not about you only right? It is about something. So do mention that as well. You have to plan things accordingly before it has to be done. People usually read the about me section so that they can find some sort of inspiration. Therefore, you must mention about those qualities and experiences that have moulded and shaped you as a person. You must have some faced some obstacles in life that have made you stronger. Talk about them. People always want to learn from these stories. So go ahead and mention that. When you start doing things like these, you tend to write engaging posts and invite more people to read and show interest in your blog. When you are writing a blog post, especially the about me section, you have to make sure the sentences are well written and don’t have any grammatical errors. The sentences should also be well constructed, should be simple and easy to understand but at the same time fun to read. For that, you have to make sure there aren’t any grammatical errors whatsoever. Your sentences should be fun to read and very much entertaining. Therefore, read your text thoroughly and then update it. No matter what you are posting on your blog, it is essential that you proofread it. Always remember that people don’t want to read posts that have been written properly. It could be a major turn off. If you want to attract more people through your posts, do proof read them and make sure the post looks attractive. Therefore, we would definitely suggest you proofread the post. Trust us when we say this, these small tips and ideas could really help you write a rocking blog and about me section. Now that you are done writing the post, don’t forget to write the conclusion part either. It is essential and very helpful. People will be able to understand you in a much better way. If you don’t know how to write a conclusion, we can help you with that as well. You could mention something like how much you have loved talking about yourself and that you promise to get back to people who have doubts and queries and that you will write often so that people are updated regarding the blog. A final point you should remember about writing you are about my section is that you shouldn’t repeat yourself at all. Even though there are chances you will end up saying the same thing again and again but we would suggest you not to do that because people will really get bored with your write up and not want to stay updated. If you really want people to show interest in your blog, then keep the about my section an attractive post to read. Avoid sentences that are not needed. Keep things simple as much as possible and most importantly check for those words that can be replaced with better words. Also, check which word you use often. Remove them while editing. If you want to write a good about me page, you have to keep the paragraphs short. Don’t write too much about yourself at one go. You can break them all down one by one so that people are able to read in a much better way. Also, remember that the sentences must be sweet, short and very crisp. The rules of the structure have to bend a little since the web based publishing became one norm, but you have to try to keep the ideas isolated to keep things neat and precise. To know whether you should edit your post any further, you have to read the post and ask someone else to read. They will be able to tell you whether the post is worth reading or not or whether some changes should be made. Ask the person who is reading it to review the post. Talk about the points and if they have come across well! See if the piece is prompt enough and if the blog is good enough or not. The person can give you great advice regarding the about me section. So do take some help from them! Finally, you should share your blog on social media so that more people show interest in reading your blog and about me page. That will definitely bring more people and let them be attracted to your works. You will have more workers and even more traffic in that way. Try it and do let us know. This brings the post to an end. Always remember that writing a blog post is not as difficult as it may seem it to you. It is a piece of cake if you know how to do it the right way. The ideas enlisted in the post above are quite simple and helpful. If you have liked them and would like to share with us, do let us know in the comment box below. Your questions are also appreciated by us. We look forward to hearing from you. On that note, good luck and here’s hoping your blog is a successful one in the near future.